The Noosa Jazz Festival is one of Australia's favorite Jazz Festivals and 2010 marks 20 years of its celebration. The event is held in the stunning resort town of Noosa Heads over four days, from 2 September to 5 September, in which a variety of Australian and Internationally acclaimed musicians play genres of jazz ranging from traditional to contemporary funk and blues. This year's event features the US sensation Warren Vache, brilliant New York trio The Bad Plus, Internationally acclaimed Barbara Jungr and much much more. 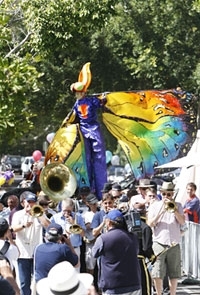 In 2010 expect to see a few surprises and special treats as the event brings about its usual spontaneity and celebrates being Australia's longest running jazz event. On top of the Jazz Festival, Noosa has pristine beaches, beautiful national parks and an extensive range of activities and things to do. BookToday has a great selection of accommodation that will have you close to the action of the Noosa Jazz Festival.